I had the pleasure of guesting on fellow Uncommon YA author, Melissa Wray’s blog on Tuesday, August 12, 2014. Here’s the interview. And thanks for having me, Melissa! Though I always loved reading and suspected I’d write one day, I didn’t get serious until I was earning my master’s degree. During class one Saturday, my professor said, “So you’re a writer?” I had difficulty answering because I wasn’t published at the time. As if publication is what defines a writer! Several professors and fellow students encouraged me to write and to submit my work. Soon, I’d published some poems, and my fiction gained the attention of an editor and agent. Those early validations, and the belief of my wife, who never doubted, helped me truly embrace the role of writer. So many things. As an actor, I loved those rare moments of “losing myself” in character. The same thing was occasionally true when creating art. Time slipped by unnoticed. I’ve found that same zone in writing. When creating (or simply listening to) characters, I sometimes get lost in their reality, an amazing feeling. At the other end of the process, I truly enjoy and appreciate impacting readers, making them laugh, cry, FEEL. That’s enormous. Totally gratifying. What is the hardest aspect of being a writer? Like many writers, I sometimes struggle with the isolation of a solitary craft. But even as I type that, I’m reconsidering, because, surrounded by characters, I don’t really feel alone. I guess the uncertainty, fear that next idea may not come, or that, when it does it, might just be a dud. I definitely grapple with self-doubt, but I think that’s natural for any artist–and ultimately leads to not settling. I tend to push myself hard for constant improvement in my work. Lord, yes! My poetry separates into two camps: outward-focused, addressing topics that anger–or amaze–me in the great, big world, and personal, family-focused stuff. I’m not afraid to “go there” in either camp. I also tackle heavy stuff in my fiction, some of which draws on content from my own life. I tell my students successful writing demands observation. Writers must engage with life–even the silly-seeming, random occurrences, because we never know how their specificity might influence our writing. I frequently steal life detail to enrich my fiction. For example, in my recently completed YA manuscript, the protagonist, Teddi Alder, is a young woman who lives next to a park, in a renovated former family store. NOT coincidentally, my family and I live in the former Ralph’s Market, next to a city park. Oh, and Teddi and I both have pet cockapoos with wonderfully quirky personalities. And we both love giraffes. Tell us about your publications? 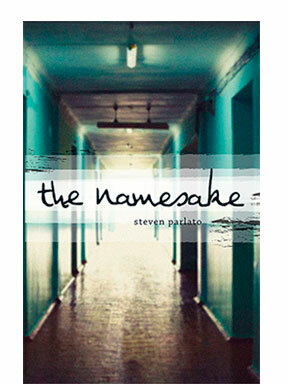 The Namesake (Merit Press, 2013), my debut YA novel, is a realistic contemporary, about fifteen-year-old honors student, Evan Galloway, grappling in the wake of his father’s suicide. The novel follows Evan’s brave journey to uncover the truth behind his dad’s tragic choice. In excavating the past, Evan makes several unsettling discoveries, questions his Catholic faith, and realizes there is an after, though not necessarily a complete “happily ever.” The book’s humor leavens the dark content, but it’s an intense read, addressing suicide and sexual abuse head-on. I’m proud of its authenticity. Kirkus Reviews described The Namesake as “a memorable, disturbing story, carefully wrought,” and Publishers Weekly said my book is an “introspective debut…complex and solidly woven,” going on to call me “a name to watch.” That still makes me smile. I’m also widely published as a poet, and some of my poetry and artwork can be found [here] on my website. What is the most surprising thing about writing/publishing you have learned? After the initial huge and thrilling surprise that industry professionals liked my work, I’ve been surprised every step of the way. For example, it wasn’t until I was contacted by the actor readying to record the audiobook that I discovered The Namesake would be released in that format. It’s still a surprise to walk into a bookstore or library and find my creation on the shelf. And I’m often surprised by readers contacting me, whether to say they loved Evan, were frustrated with some aspect of the book, or that my story made them feel less alone in their own struggle. I focus on these good surprises, letting slide those concerning bad communication, the need for constant self-promotion, the relentless waiting, all those day-to-day drudgery surprises we writers face. Probably the two most important are to be open and to persist. Be open to the world around you, drink it in. When we pay attention, life detail can create beautiful sparks in our writing. Persistence is absolutely essential. There will be many negative voices (often the loudest live in our own heads), claiming we won’t succeed. My advice? Turn up the radio, hum loudly, do what it takes to tune them out. Focus on those voices, moments, signs that energize you, drive you forward. They may be quiet, tiny, nearly invisible, but they are there. You just need to recognize them. Other than writing what else do you love? Moments laughing with my family, learning from my son and daughter, both amazingly bright people. Being in the presence of my incredible wife. Watching great movies, reading powerful stories, The Book Thief is a favorite. Discussing literature with my students. Drawing and painting, for which I have so little time these days. And the theater, my first love, whether attending a play, or—how I miss this!—performing on stage. And I do love giraffes, but I already mentioned that. If you had a premonition you would be stranded on a desert island what 5 books would you take? I’m terrible at “favorites” type questions, but I’ll give it a shot. The Complete Works of Shakespeare; The Book Thief; my friend Edwina Trentham’s glorious book of poetry, Stumbling Into the Light; a blank book for writing—and of course, How to Survive on a Desert Island—because I am severely lacking in outdoor skill. Five words that sum you up. Thanks again, Melissa, and all best on your own writing journey! Thanks so much for doing the interview Steve. It was great to learn more about you! It was my pleasure, Melissa!